Hello, and welcome back to the Mattress For Less blog! 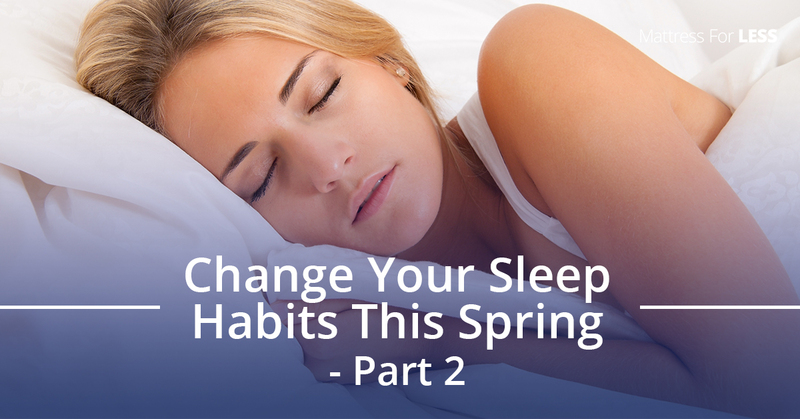 Lately, we’ve been talking about your spring-time sleeping habits. Spring is that perfect time of year to get rid of the clutter whether it is physically inhibiting your space or negatively affecting any part of your life. Just because we don’t have dust bunnies hiding in the corners of our home, doesn’t mean that we couldn’t use a little revamping of our habits and refocusing on what we need in our lives. If you are just joining us, in our last blog post, we gave two tips for changing your sleep habits so you can get more and better shut-eye. First, we suggested putting away your phone — and really, any electronic device — at least 30 minutes to an hour before you turn out the light. The light from our devices causes our body to think it’s time to wake up instead of beginning to shut down. Also, we suggested that you stop the right-before-bed munching. Not only are the crumbs gross, but many snacks can create heartburn and other digestive issues that will keep you up late or even all night! The luxury of going to bed with a nightcap is undeniable, but if you make it a practice, you may be negatively affecting your sleep. Alcohol actually isn’t a productive way to self-medicate sleep deprivation. Why? First, alcohol is usually filled with sugar and even though a nightcap may help you to pass out, later, because your body is processing the sugar, you will wake up with a good sugar buzz and unable to sleep. Also, because alcohol suppresses the stress hormones in your blood, later when the alcohol has worn off, you may be awakened by these stress hormones that are no longer being suppressed. You may also be awakened by your bladder. Alcohol is a diuretic and so you can expect to visit the lou quite a bit during the night. Alcohol also causes us to crave food, because it drops our blood sugar, making us want to eat right before bed, which, as we read above, isn’t the best for our sleep either. Many smokers will say that taking a drag right before bed helps them to sleep. We can’t speak for everyone. However, we can say that according to SleepApnea.org that smoking before will actually do the opposite of calming your body. Because tobacco is actually a stimulate, you are awakening your body and most likely causing difficulty for your respiratory system by irritateing its airways. Chronic obstructive pulmonary disease and asthma, which cause a myriad of problems including interruptions in your sleep, are a result of smoking no matter what the compound is. Stop in to Mattress For Less! Getting enough sleep is a must! Sleep refreshes the body, allowing it to rebuild, repair, and to wash away harmful toxins. When we don’t get enough sleep our bodies tend to break down and it’s easy to get sick, and even suffer long-term consequences. To avoid all of that, change your sleep habits and be sure that you have a good mattress that will support your sleeping needs. Come into our Mattress For Less and get what you need to sleep tight every night in Waterbury.